For other uses, see Gayhurst (disambiguation). 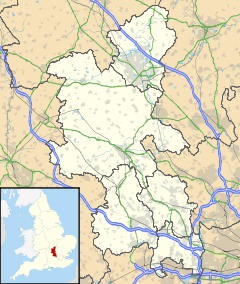 Gayhurst is a village and civil parish in the Borough of Milton Keynes, ceremonial Buckinghamshire in England. It is about two and a half miles NNW of Newport Pagnell. The village name is an Old English language word meaning 'wooded hill where goats are kept'. In the Domesday Book in 1086 it was recorded as Gateherst. At that time the manor was owned by Bishop Odo of Bayeux. Gayhurst had an outstation from the Bletchley Park codebreaking establishment, where some of the Bombes used to decode German Enigma messages in World War Two were housed. Gayhurst House is reputed to have once belonged to Sir Francis Drake although it is not known whether he ever lived there, and for many years the gatehouse leading to the estate was a public house called the Francis Drake. The house certainly once belonged to the father-in-law of Sir Everard Digby (1578–1606), one of the conspirators in the Gunpowder Plot of 1605, and he resided there for some time. The church of St Peter was built in the classical style in 1728 to replace a medieval church; the designer is unknown. ^ Parishes in Milton Keynes Archived June 8, 2009, at the Wayback Machine - Milton Keynes Council. Wikimedia Commons has media related to Gayhurst. 'Parishes : Gayhurst', Victoria History of the Counties of England, A History of the County of Buckingham: Volume 4 (1927), pp. 343–347.